What does it mean when I say that we offer development advice? Seek to understand the aims of the owner. Understand the building in use and its weaknesses. Assess possible new uses of the site and its location which will suit the aims of the owners, both socially and financially. Design a new solution for the site – one which is affordable, attractive to add value and which generates sufficient space to be fundable. Contact the local authority to determine the likelihood of gaining permissions. Put together the right design team. Introduce funders who suit the owners. Seek permissions and tender the work. Recommend the optimum contract form and administer a building contract. A good example of our approach is a recently completed mixed-use building on prominent site in the west end of Glasgow. It contains a modern Methodist church hall which suits the small congregation with 24 retirement flats on top. This sizeable building replaced a small red sandstone church with its dilapidated hall. The original church needed a large amount of investment to repair the roof – as they do so often. When an aging congregation receives one of these quinquennial reports citing five figure replacement costs they are often deeply concerning and they accelerate the need to do something about the building. To add insult the lead was stolen from the church roof as we were planning the work, accelerating the decline of the building. We were approached by the church congregation to suggest solutions to replace the buildings. The problems were easily understood; it was a dilapidated building which was quickly getting worse. A replacement hall would be a god-send for the congregation, but a new church hall doesn’t pay for itself, so the site had to become mixed use. There had to be more value generated from the land. This popular part of the city was an obvious location for flats, but there was no space on the site for parking, which was a Glasgow city plan requirement despite the city centre location. No parking meant no open market housing would be permitted. Housing without parking could, however, be built by a Housing Association, provided the use was constrained and a lease condition was included to prevent occupants from owning cards. Despite the state of the church the building continued to be used by various community groups, so it had a local value, and creating a new building raised hopes that the congregation could be increased in number. The first question for the local authority could have been the showstopper – could a red sandstone church be demolished and replaced? The city plan presumed against removing churches. It wasn’t a listed building, but the city contacted Historic Scotland for an assessment. It is a melancholy duty to demolish a church, there was a lot of history recorded in frames and plaques on the walls, but most could be removed and stored, so that’s what the congregation did. HS reported that it was a plain inter-war building, and not every church deserves listing. This response allowed us to lodge a certificate of lawful demolition meaning that the building could be taken down without any further planning permission. Once the principle of demolition had been accepted it was time to engage the city planners in the design of the replacement building. The planners thought this site worthy of the input of the Glasgow design champion, and numerous design meetings followed. The site was even selected for review by the Glasgow City urban design panel. We presented to a large number of worthies who concentrated on the minutiae of the building design, completely ignoring the social benefits or the complexities of our proposal, in opposition to the name of the panel. The whole session was an exercise in bashing the architect. It advanced the design of the building not one jot and we would not waste our time attending such a meeting again. As well as being deficient in space for parking the site was also deficient in open space. A design was developed which contained two different south facing flat roofs, secure and elevated from the street. These spaces are reserved for the occupants of the flats. It turns out they have great views across the city and the hills beyond (some things you don’t fully appreciate until they are built). The design had to be efficient and sufficiently dense to stack up. The site is sits on a trunk road, prominent with open space in front of it. Numerous streets meet at jaunty angles and must all be addressed by the building which sits at their heart. The floor plan was developed to ‘cartwheel’ around one single escape stair and lift in order to minimise the unproductive costs of the development. Numerous windows add a complexity to the elevations and tell the story of the interior of the building. The building had to be dense enough to make commercial sense, yet it had to properly address its neighbours and bookend a tenement block, whilst maintaining the look of a ‘worship centre’. Stone from the original building was carefully identified to be re-used in the new building, and new brick had to be carefully coordinated to match. Eventually the replacement design was given the green light by Glasgow City Council. At the same time as the design was being developed we worked suggested a suitable housing association to the church as a development partner, one who could seek and channel city social housing funding into the site, promote the site to the council and support the community consultation process. Sanctuary Scotland were the housing association who took on the site. 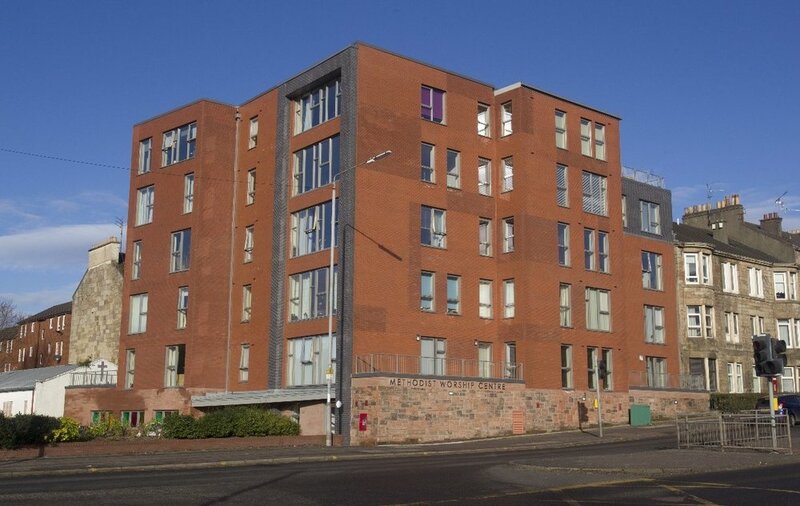 Sanctuary were in the process of building up a hub in Anniesland which allow them to efficiently manage numerous nearby properties. The housing association attended community consultation events with us, at which we were astounded to be approach by future residents, keen to live in this highly accessible area. Sanctuary had the contacts with the city to seek grant funding. They worked with the owners on the land transfer and funded legal costs. Each project needs a different team. In this case we had put the job together, designed the building and introduced the developer to the land owner. The complex structural solution was designed and monitored by Clyde Design Partnership. An exacting energy efficient heating system was a requirement of funders. It was designed by Ken Boyle. All designers were nominated over the to builder, meaning we switched from being employed by the housing association to the contractor to complete the detailed design. Glasgow has a small number of affordable housing specialist contractors. CCG won the tender and delivered the building using a design and build contract. This form of contract allows the builder to deliver a building in the most efficient way. As architects we were novated across to work for the builder during the contract. Of course even the most efficient way was highly complex… the original church was built below a tenement and there was a fear that the flats would move during the demolition. So the new foundation was literally massive, acting as a buttress to the existing buildings above. Above the foundation sat 2 floors of masonry, with steel frame infilled with timber panels over. All clad in brick with large window openings and built to Scottish Silver Standard levels of energy efficiency. It was the ultimate hybrid construction on a complex and tight inner-city site. A brick arch was a significant design feature on the most prominent elevation, referring back to the original church building. Unfortunately this part of the design didn’t survive cost savings and the building is the worse for it. As a development it was a total success: The church was re-built for the congregation at no cost to themselves. 24 popular retirement flats were built in the space that the original church occupied. I am reminded of a conversation I had with a planning officer when I suggested that the future of all cities was increased density (density generally increases vibrancy and interest). He called me a naïve architect. A communal gas and micro-renewable heating system ensures that the building is highly energy efficient and cheap to heat for the retired residents. Large living room windows open onto the main road below. When you pass the building it is a pleasure to see that most residents leave curtains open, so that the windows are like a TV screen playing domestic scenes to the traffic below. Of course delivering the building was a lengthy journey which took time and faith on all sides. It took around fours year, from first meeting to completion and handover. Organic Architects took a lot of risk in setting up the job, working pro-bono for years before we located a paying client. For us it is both a way of creating a workstream for ourselves whilst also doing something of significance for the community. This is a model which community groups can use to regenerate their sites. Each site has its own challenges and every building has its own individual solution. But we have proven that great results grow out of the goodwill of imaginative and commercially aware designers who can guide owners through the early stages of redevelopment, mindful of planning and commercial constraints. It’s no surprise that the number of visitors to Scottish Distilleries is higher than ever. This certainly matches our experience, every distillery we design has the visitor experience as its starting point. What does an architect know about development? For five or six years I had the pleasure of working with the whisky legend Jim Swan before his untimely passing last year. Jim was a world-renowned expert in the chemistry of distilling, but his experience went wider than that, he was central to the growth of craft distilling, perhaps he was fundamental its expansion. His wisdom and experience was the cornerstone of numerous craft spirit start ups, and his name gave comfort, a guarantee of quality, to investors. I gave a talk last week to the Scottish Craft Distillers Association on the subject of visitor centres in new distilleries.